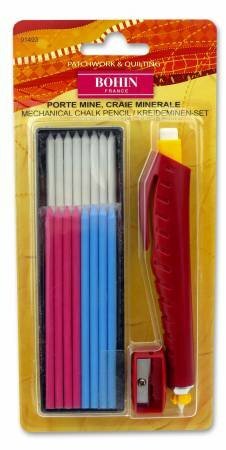 These chalk cartridges are special because, in addition to precise line marking, can also carry out exact point marking. Use on a wide range of surfaces; textiles, wood, paper and plastic. Use for hobbies, sewing, quilting model building and more. Break proof packed, easily changed thanks to the patent hod mechanism. Excellent fabric use, washes out without a trace, even after ironing. No wax, natural chalk. Eight white and eight assorted cartridges. Includes chalk holder and sharpener.